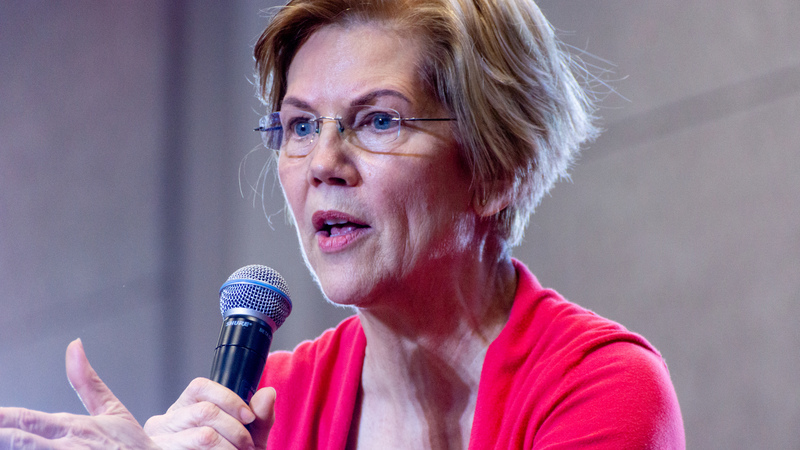 Image Description: Elizabeth Warren speaking at event. Recently, tech companies in particular have come to be regarded as a threat to democracy. This is partly the result of worried discussions of Russian troll farms extending the will of the Kremlin into Western elections through ubiquitous ‘fake news’. However, our conception of democracy extends further than the ability to exercise choice through elections. It also means choice in the economic realm, rather than being subjected to the whims of corporate monopoly powers who set the terms of our lives with little accountability. It is in this sense that companies like Amazon, Facebook, Apple or Google can be regarded as curbing our ability to self-govern. The gradual annexation of the internet sales market into Amazon’s pocket, with nearly fifty percent of all e-commerce going through Amazon, currently seems like a hostile invasion using brute force. Take Amazon, for example. Amazon’s control of hundreds of warehouses and the Amazon Marketplace gives it information on competitors that allow it not only to instantly undercut its competitors’ products, thereby gaining a competitive advantage, but also to charge them differing rates for use of their warehouse facilities in order to weaken competition. This is not merely theoretical; Amazon is currently being investigated by the EU Commission over allegations that it has used the data it collects on the sales of competitors on the Amazon Marketplace, to identify successful products to copy for its own Amazon Basics range. The gradual annexation of the internet sales market into Amazon’s pocket – nearly fifty percent of all e-commerce goes through Amazon – currently seems more like a hostile invasion using brute force, rather than a business providing a better service on an equal playing field. Enter Elizabeth Warren. The 2020 presidential candidate is perhaps the only Democrat in recently memory to pay more than lip service to concerns surrounding the worrying concentration of power within the tech industry. Her platform relies on two key promises: to prevent anti-competitive acquisitions within the tech industry and to prevent abuses of market power that occur when a company both owns a marketplace and sells products on that marketplace. The prevention of market power abuse would be achieved through designating a group of companies that make $25bn in revenue worldwide and offer a ‘marketplace, exchange, or platform for connecting third parties’ as ‘platform utilities’, with no platform utility being able to both own and sell products on that platform. This would mean Amazon Basics and the Amazon Marketplace would have to be owned by different companies, for example. The same would apply to the Apple Store and Apple Music, or Google Search and the Google Ad Exchange. The prevention of anti-competitive acquisitions would simply be achieved through a change in the way competition law works in the US, back to the age of Roosevelt rather than the sea change that occurred in the eighties. The most important contributor to this change was a man called Robert Bork who wrote The Antitrust Paradox (1978). In this book, Bork argued that the aim of competition policy should not be to limit the size of companies, but simply to ensure that the quality of service to the consumer was not impacted. This conception of antitrust policy was adopted by Reagan, whose presidency saw a boom in mergers and private sector concentration, and is invoked today by defenders of the tech industry who claim that the superior services companies like Amazon or Google provide are evidence that they shouldn’t be broken up. For example, prominent tech industry blogger Ben Thompson highlights that the difference between monopolies of the past and modern tech industries is that these tech companies “aren’t limiting consumer choice by controlling supply… rather consumers are self-selecting onto the [company’s] platform because it’s a better experience”. High market concentration necessarily reduces quality because it entrenches old methods of thinking that may seem beneficial for now, but slow (or even entirely prevent) much better ideas that haven’t even been recognised yet from gaining a foothold. The problems with the idea that monopolies shouldn’t be broken up as they provide a better service are twofold. First of all, it relies on the assumption that what we would consider good quality in the present is necessarily the best state of affairs that there could be. The nature of tech companies does make it such that network effects improve the service as the company gets bigger; a general pattern is that more users means more data which means better tailored services which means more users ad infinitum. However, the beauty of competition is that it allows ideas that the current entrenched companies would never have thought of to be brought to the market. The nature of a company that is extremely successful using a current business model is that it is unlikely to radically change that business model for the foreseeable future. High market concentration necessarily reduces quality because it entrenches old methods of thinking that may seem beneficial for now, but slow (or even entirely prevent) much better ideas that haven’t even been recognised yet from gaining a foothold. Secondly, it assumes a level of benevolence from the owners of tech giants that is idealistic at best. The fact is that the Wikipedia page detailing the anti-competitive and abusive practices Amazon is accused of is bulging with a smorgasbord of offences, most of which are in some way a consequence of Amazon’s size and market power. It seems much more efficient to counteract some of the most egregious offences through simply removing the ability for CEO’s to engage in damaging and anti-consumer practices by limiting corporate size, rather than trying to deal with every single instance of bad behaviour. That being said, I am not totally on board with all of Warren’s proposals. For example, her plan to split Google Search from the Google Ad Exchange is particularly problematic, given that Google Search is funded by Google offering advertisers the ability to promote their products and services on its search platform. It seems too great a harm to seriously damage the viability of Google’s entire business model in order to perhaps promote more competition in search engines and internet ad-hosting services. However, in regard to other tech companies like Amazon or Facebook that clearly have been abusing their power, it is clear that consumer experience can only be improved by promoting healthy competition and curbing the tech giants’ ability to rig the economic system in their favour. Mark Zuckerberg may be a prince for now, but a revolution is on the horizon.